William Peseski is an Associate who practices general liability insurance defense, commercial civil defense, and general civil litigation. Mr. Peseski has assisted in the trial of several cases in various jurisdictions across Ohio. 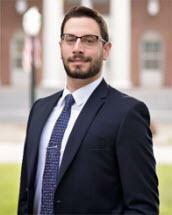 Mr. Peseski is a 2015 graduate of Case Western Reserve University School of Law. He is admitted to practice in the State of Ohio, the United States District Court – Northern District of Ohio, and the United States Court of Appeals – Sixth Circuit. He graduated in 2012 from Wayne State University with a Bachelor of Science Degree. Prior to joining BSPH, Mr. Peseski was an Associate with a firm practicing white collar criminal defense, construction litigation, and commercial civil defense. He was also a Judicial Extern for the Honorable Judge John P. O’Donnell for the Cuyahoga County Court of Common Pleas. In his spare time, Mr. Peseski is a volunteer mentor for Minds Matter – Cleveland chapter, an organization transforming the lives of accomplished high school students and preparing them for college. Originally from Oakland County, Michigan, Mr. Peseski has a love for working on muscle cars and competitive team sailing.